Playdough mats, games, clip cards and MORE! 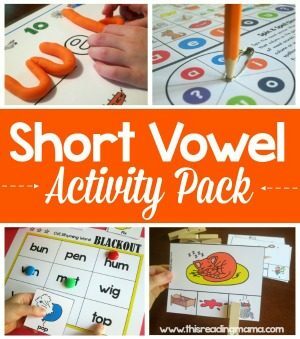 In this Short Vowel Activity Pack, you’ll find hands-on and fun activities for teaching kids how to read AND spell short vowel words. If you’re looking for some fun and hands-on ways to help your student or child learn how to read and spell short vowel (CVC) words, look no further! Included in this HUGE pack are 14+ activities that make learning short vowel words FUN! Read more about each activity listed below here. 1-2-3 Spell It! & 1-2-3- Flip It! *These printables are BONUS GOODIES in this pack!